If 13-year-old Jordan Romero makes it to the top of Mr. Everest, he'll be the youngest person to stand on top of the world. Looming at 29,035 feet, Mount Everest's peaks are unmatched by any other. Everest's tall, tricky slopes end in death for one of ten who attempt them. But Jordan began scaling the world's tallest mountains when he was just 9 years old. By the time he turned 12, Jordan had conquered five of the seven continent's tallest summits. Now that he's 13, Jordan is setting his sight on the tallest peak: Mount Everest. As usual, Jordan's father, Paul Romero, and Paul's girlfriend, Karen Lundgren, will guide Jordan on the slopes. This Thursday "Early Show" special contributor Ayla Brown" visited Jordan to learn how he'd been preparing and how he was feeling the day before leaving for Everest. Brown asked what Jordan's friends thought of his attempt to climb Mount Everest. "Well, they are more psyched about me climbing Everest," said Jordan. "It's one of the few big mountains that they know about." After checking in with Paul and Karen, Brown learned that Mount Denali in Alaska was a key accomplishment for Jordan's climbing crew. Karen described Jordan's success at Denali as the moment she and Paul knew Jordan could tackle taller peaks. 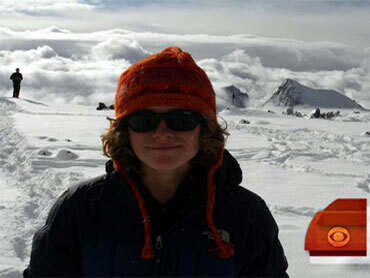 "Denali was a turning point for us climbing mountains," said Karen. Jordan agreed, saying, "I was sobbing once I got to the top because I reached the highest mountain in North America." Paul was also proud when he recalled Jordan's climb in Alaska. "The strength and the fortitude and the manliness he showed was something I'll never to get," said Paul. "It was when he just broke out of whatever shell he had, and he became a man." Although Mount Everest is taller than Denali, Jordan explained that some consider Everest a less rigorous climb. "People have been saying that (Denali's) tougher than Mount Everest, but we don't know that," said Jordan. "We'll see -- only one way to find out." Brown mentioned that many who have climbed through Mount Everest's so-called "death zone" questioned whether a 13-year-old's judgment and reflexes were developed enough to handle it. But Jordan and his climbing crew remain optimistic about his attempt to claim a world record as the youngest to climb Mount Everest. "I'm no dummy, I know that a lot of people have died," said Paul. "The upper part of the mountain is literally a graveyard, and I have an incredibly strong young man that I would take over several of the professional athletes that I know and work with." So what is Jordan afraid of? "I'm most afraid of just -- well, of course it's dangerous up on the mountain," said Jordan. "But, I'm aware of it. I don't want to ignore it, but I just want to climb my best." Jordan's daily training involves strength and agility workouts to help him reach his peak physical ability. One of his endurance exercises requires Jordan to run around wearing a heavy backpack attached to a tire that drags on the ground behind him. Even Jordan's blood is being prepped for the thin air of mountain peaks. He sleeps in a special tent that helps him adjust to oxygen-sparse environments. Brown found the tent "cool," but she wasn't the one who had to sleep there. "How many hours do you sleep a night here?" asked Brown. "About six," said Jordan. "This is a way for me to condition my blood for the altitude up on Mount Everest." With all that training, Brown wondered if there was another reward at stake beyond achieving a world record. "What's the first thing you do when you come back down from Mount Everest?" asked Brown. "I haven't been thinking about that," said Jordan. "But, that's probably to throw the biggest party." "Are we invited?" joked Brown. If Jordan makes it to the top of Mount Everest, he plans to tackle Mount Vincent in Antarctica later this year. This would make him the youngest person to climb the seven summits famed as the tallest points on every continent. Back at "The Early Show" studio, "Early Show" co-anchor Harry Smith asked Brown if Jordan seemed mature to her. "Yes," said Brown. "I was very skeptical because I thought to myself how can a 13-year-old handle this. But after meeting him, I'm very confident that he can do it." Jordan, Paul and Karen leave for Mount Everest Friday, starting a climb that begins with a stay near Mount Everest. "It actually takes about six weeks to two months to do the whole process because they have to get their lungs accustomed to the thin air," explained Brown. "What about school?" asked Smith. "School?" said Brown. "Although he's 13, he took a kind of leave of absence for the semester. But, what's very impressive is that he's taking two-months-worth of homework on the trip to Everest. He loves math; he does it everyday, and I'm sure he'll be doing it when he's on the summit." "That's right, I would love to make the summit, Dad, but I've got to finish my trigonometry -- I'm sorry," joked Smith. "But this is very interesting," Smith continued. "I was skeptical, too, just going into the sorry, but seeing him -- seeing the preparation involved -- and while talking to his father, this is a highly -- under the best of circumstances -- a highly dangerous thing." "Exactly," said Brown. "Many experts believe that a 13-year-old's mind is not mentally prepared to handle the challenges in case anything bad were to happen. But at the same time, other experts say that because he's already climbed five out of the seven summits, what's Everest."